Mcallen, TX – Is Texas Spending $800M To Create Its Own Border Patrol? Mcallen, TX – When former Gov. 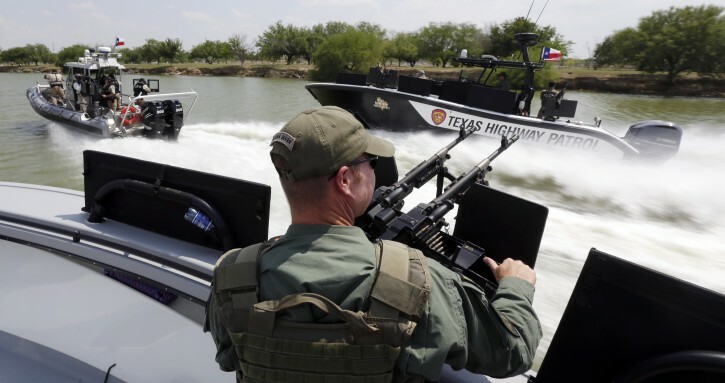 Rick Perry ordered a big reinforcement of security at the Mexico border in 2011, Texas bought six new gunboats that can fire 900 rounds a minute and clock highway speeds. But the boats, which cost $580,000 each, spent more time docked than patrolling the Rio Grande. That was a small price tag compared with what Texas is about to spend. The new Republican governor, Greg Abbott, this month approved $800 million for border security over the next two years — more than double any similar period during Perry’s 14 years in office. On Texas’ shopping list is a second $7.5 million high-altitude plane to scan the border, a new border crime data center, a 5,000-acre training facility for border law-enforcement agencies and grants for year-round helicopter flights. The state also wants to hire two dozen Texas Rangers to investigate public corruption along the border and 250 new state troopers as a down payment on a permanent force along the border. Other states along the nearly 2,000-mile Southwest border — New Mexico, Arizona and California — do not come remotely close to the resources Texas has committed. And Texas is doing so long after last year’s surge in immigrants crossing the border illegally has subsided. So why is Texas setting up what appears to be a parallel border patrol alongside the federal force? The 320-mile Rio Grande Valley sector of the border was ground zero last year for a wave of Central American migrants, mostly unaccompanied minors and women with children. The Valley sector accounted for 53 percent of all migrants captured in the Southwest during the fiscal year ending September. That alarmed Texas Republicans, who called for a crackdown during the election campaign last year. But the number of migrants caught is down 44 percent in the first eight months of this fiscal year. Raul Ortiz, deputy chief of the federal border patrol’s Rio Grande Valley sector, attributed the decrease mainly to beefed-up law enforcement on the Mexican side, especially along its own borders with Central America. He also gave a nod to the Texas Department of Public Safety, or DPS, and other law enforcement for helping. Critics worry that the border buildup is open-ended, with little accounting for how the money will be spent and whether it will be effective. Republican lawmakers in the final weeks of the legislative session stripped language from the bill Abbott signed that would have required monthly updates and crime data from a new oversight board. The panel is only tasked with giving lawmakers a single report by 2017. “In a third-grade classroom or with DPS, if you have no metrics and no way to evaluate success, you are wasting your money,” Dallas Democratic state Rep. Rafael Anchia said. It is has not always been clear what DPS has gotten for its money. Records provided to The Associated Press in 2013 showed that the state’s new gunboats on the Rio Grande were used as little as one day a week or docked for repairs during the first year of deployment. At the time, agency leaders said that the boats spent about 30 percent more time in the water than what records suggested. DPS spokesman Tom Vinger said this month that those records are dated and the boats now conduct round-the-clock operations, performing more than 1,400 missions in the last year alone. Texas officials say that all law enforcement agencies, including the federal border patrol, have tracked more than $2 billion in drug seizures, mostly marijuana, and discovered more than 150 stash houses used by human smugglers in the past year alone. U.S. Border Patrol data, provided to Texas Democratic Congressman Joaquin Castro, show its agency being solely responsible for seizing more than 416,000 pounds of marijuana in the Rio Grande Valley sector from June to February. DPS has declined to break out how much its troopers are responsible for intercepting. U.S. Customs and Border Protection Commissioner R. Gil Kerlikowske, in a letter to Castro, said that his agency “declined participation” in the recent surge known as “Operation Strong Safety” that Perry ordered last summer, even though DPS refers to them as a partner. But Vinger, the spokesman for the Texas agency, said on Thursday that Border Patrol provides agents staff and assist a command center as part of the Texas mission and the federal agency has “worked closely” with Texas for many years. Down in the Rio Grande Valley, Texas troopers are stationed about every quarter mile inland from the border along Highway 83. The heavy trooper presence has alarmed the large community of immigrants living permanently in the area, many of whom crossed illegally years ago, said Efren Olivares, a lawyer for the South Texas Civil Rights project. Other locals see improvements in safety. Othal E Brand Jr., president of the water district that supplies the McAllen area, said employees used to be threatened by smugglers but now work safely night and day. On a recent afternoon in Rio Grande City, the Texas Cafe was full for lunch, with conversation a mixture of Spanish and English. Jaime Alvarez, a longtime resident now running for county commissioner, said residents have complained to him about the constant traffic stops along Highway 83.